June 20, 2014 — Bristol, VA. Eight activists are currently in custody in Bristol after a two hours long blockade of Alpha’s HQ in Bristol, VA. Two activists with Mountain Justice and Radical Action for Mountains and People’s Survival (RAMPS) spent the morning blocking entrance to the office. 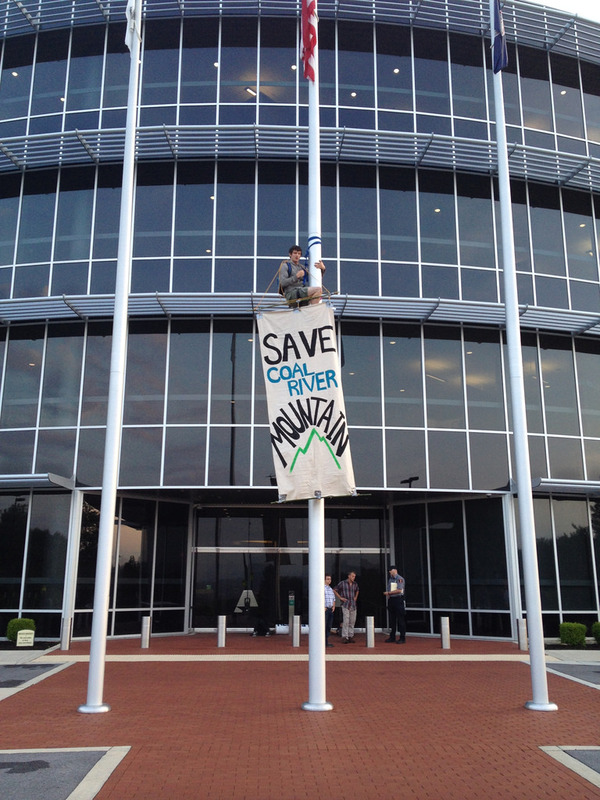 One hung with a banner from a flag pole, it read “Save Coal River Mountain” . RAMPS and Mountain Justice took the action in protest of Alpha’s devastating practices of mountaintop removal coal mining. Specifically, the groups are protesting the opening of new mines on Coal River Mountain in Southern West Virginia. Three activists demanding an end to mountaintop removal, block entrance to corporate office, stop business as usual.